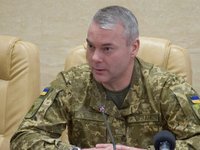 Commander of the Joint Forces Serhiy Nayev has said that the Ukrainian military reliably control the contact line in Donbas and never fire on settlements. "I state that at this stage the Joint Forces have repeatedly demonstrated the ability not only to repel the strikes of the first and second army corps formed by the Russian military leadership (the army of the so-called LPR and DPR), but also strike back adequately. We control the contact line in Donbas reliably," Nayev said in an interview with the Fakty (Facts) newspaper. At the same time, he stressed that the Ukrainian military should be ready "every minute and every second" to any possible challenges and threats.